SLEEK & SAFE – Its sleek, nickel-brushed stainless steel body can be easily held in one hand. 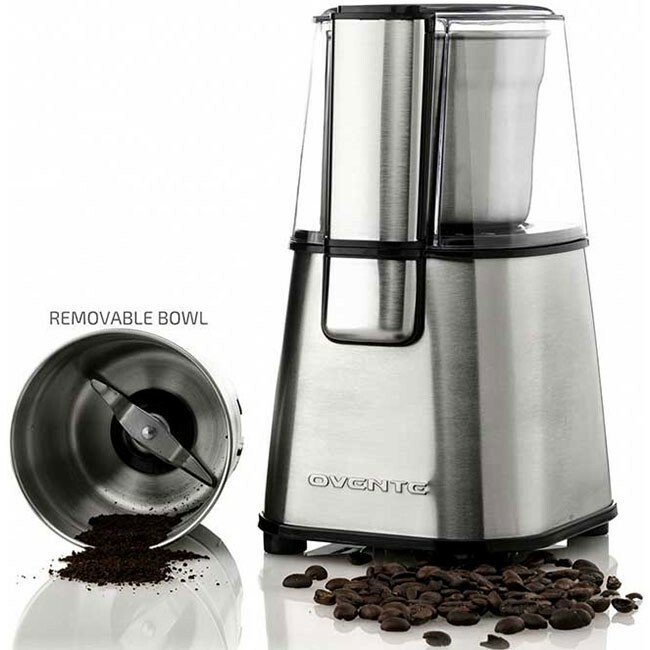 Its transparent, easy-open lid with safety lock allows you to check your grind’s texture at all times. It also features rubber feet to prevent slippage. EASY TO CLEAN – Its stainless steel grinding bowl (hopper) can be removed by twisting it to the right, which makes clean-up a breeze. Simply wipe clean with a lint-free cloth. We do recommend deep cleaning every now and then (instructions below). PRECISE – Its sharp blades are made of high-quality stainless steel, which pulverize with precision from whole to coarse or fine in seconds, depending on how long you press “PUSH”. A 4-blade bowl is sold separately for harder grinds. 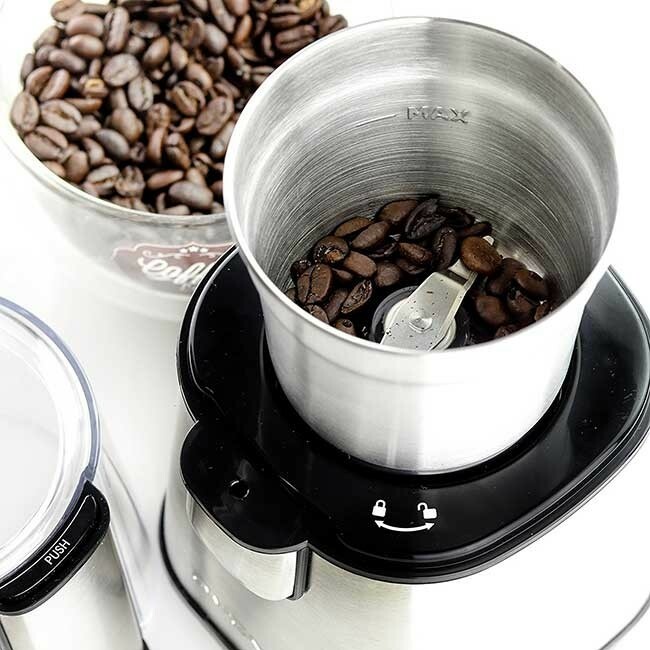 VERSATILE – With this ultra-versatile tool, you’re not limited to grinding just coffee beans. 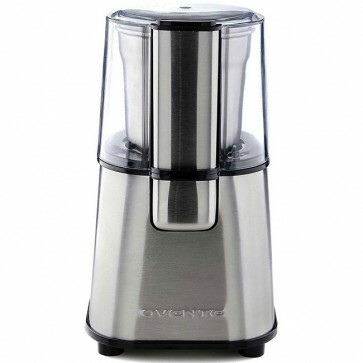 You can also grind tea leaves, herbs, spices, nuts, grains, and much more with just one touch! 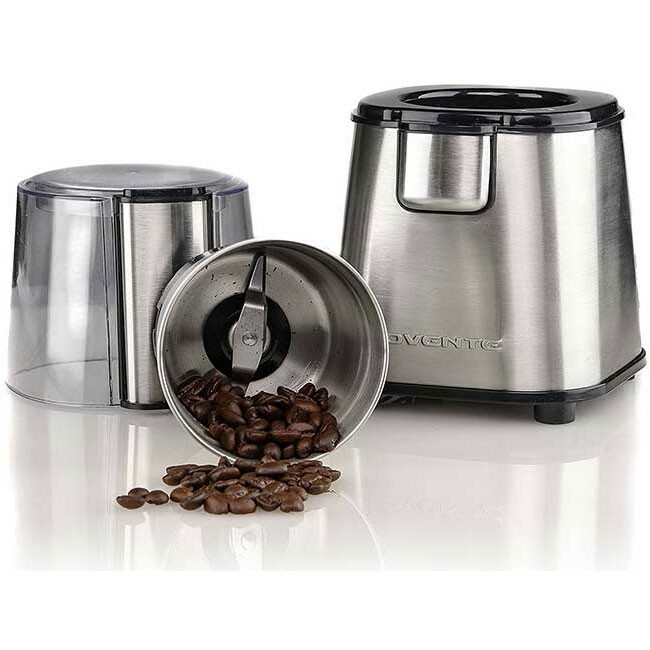 The Ovente CG620S Multi-Purpose Electric Grinder reinvigorates luscious flavors, aromas, and even nutrients from coffee beans, tea leaves, herbs, spices, nuts, grains and so much more! 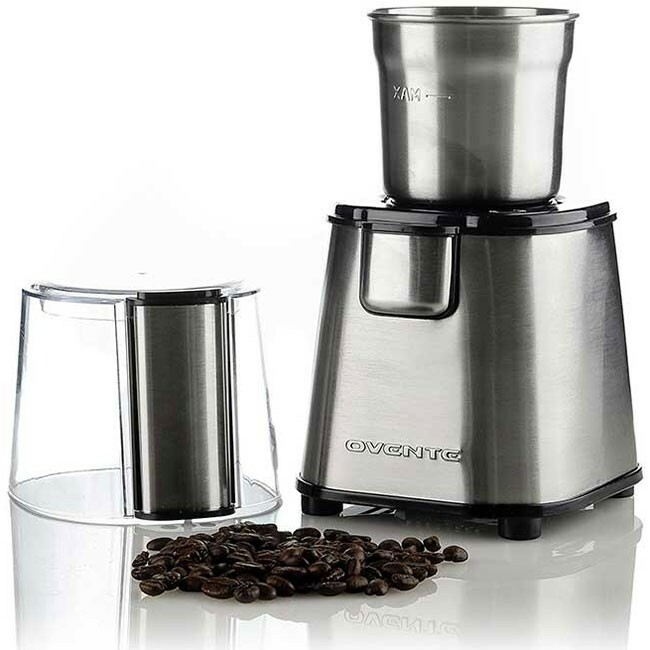 Equipped with a powerful 200-Watt motor, it efficiently pulverizes and grinds a multitude of grindable items into a freshly-ground powder within seconds—the level of coarseness is up to you. 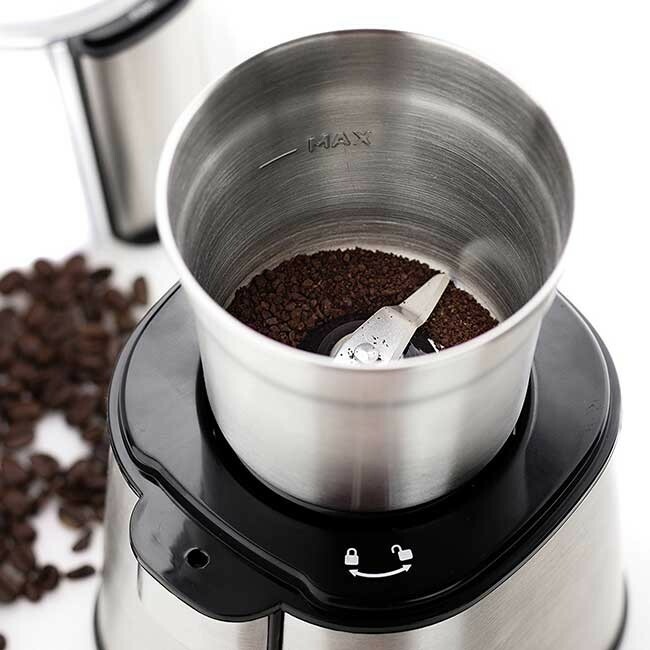 Simply press the “PUSH” button and view your grind through the clear lid until you reach your desired texture. Its high-quality stainless steel blades pave way for a better and smoother grind, and an exclusive 4-blade grinding bowl (not included) is available for sale as well. The extra blades provide crushing support for items that are harder to grind. 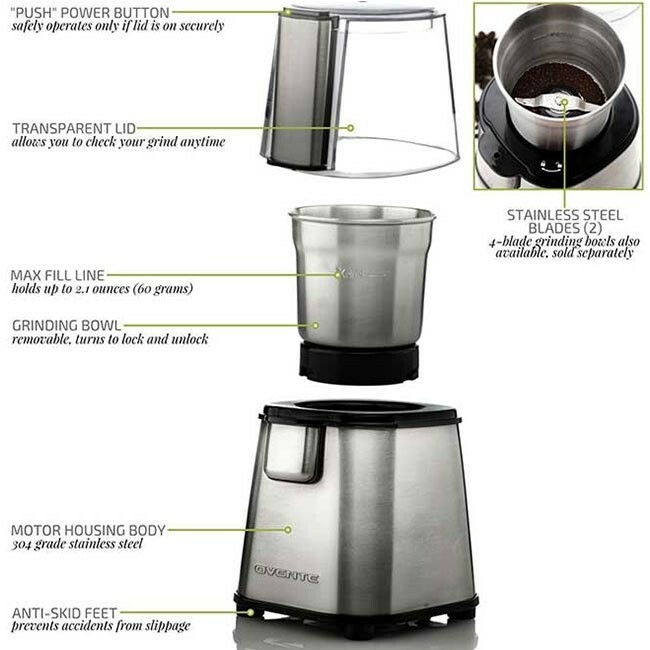 Its stainless steel grinding bowl (hopper) can hold up to 2.1 oz (60g) of aromatic and flavorful ground products. Do NOT exceed its capacity. The structure of the body was carefully designed for easy gripping, and it stands on 4 non-slip rubber feet to prevent slippage.